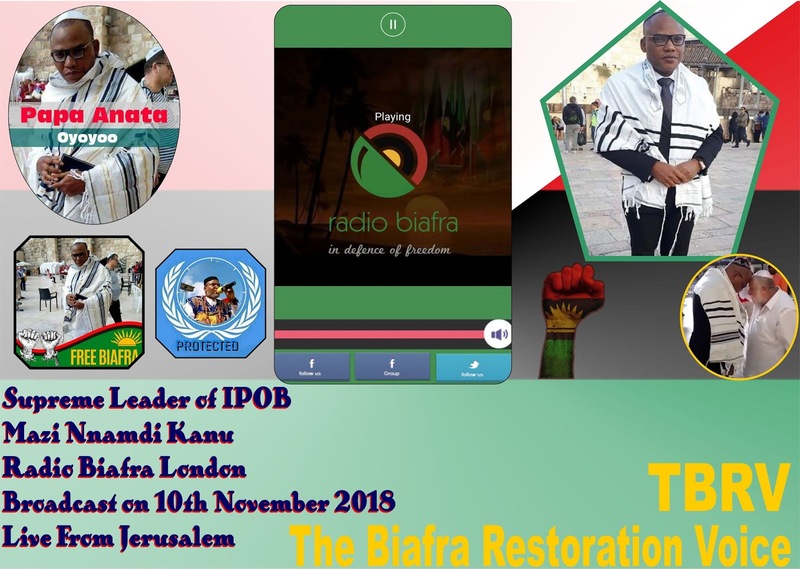 Below are except of the special Radio Broadcast of the supreme leader of the Indigenous People Of Biafra Onyendu Mazi Nnamdi Kanu from Jerusalem the capital city of Israel on the 10th November, 2018.
ü The satanic edifice called Nigeria must fall and we must rise. ü I will use the unmasking of Jubril to awaken the dampened consciousness of the black man. ü The British did not come and imposed Jubril on Nigerians, it was black people, Fulani people did. ü They are using that thing in Aso Rock to steal and loot the treasury dry. Suddenly this man doesn't fall sick again. ü Why hasn't Jubril addressed any live conference where he could be asked questions since they brought him? ü If they want to prove me wrong ask Jubril to wear suit without cap and you will see he is not the late Buhari. The word is a witness to this monumental fraud. ü Look at the ear of Jubril and look at any old picture of Buhari, compare it, you will see Jubril is not Buhari. ü If Jubril doesn't come back on Tuesday 13/11/2018 know that he has gone back for another surgery to see if they can amend those areas they couldn't. ü Osinbajo would have been sworn in when Buhari died, but both APC and PDP ganged up and said no, it must be a Fulani. ü Court asked them to release Sambo Dasuki, IPOB members, Shiites members and they refused, and you said you are in a democracy and some of you are saying you want to go and vote, are you normal, are you not stupid? ü If you are in a democracy, why hasn't the judges gone on strike and say if the federal government doesn't obey court orders, their jobs are useless, why? ü Jubril was paid 250million dollars to impersonate the late Buhari. Now they want him to contest. ü They are using the budget money to settle everyone that knew Buhari was dead to keep quiet. That is why they kept passing budget but nothing is done. ü They claim they are fighting corruption but they epitomize corruption. ü In Nigeria they manufacture corruption. If INEC accepted Buhari as a candidate in 2015 without certificate, then INEC is an accomplice. ü When you work for the zoo, do their dirty biddings they promise to reward you with political position. ü It was exactly today 10th November, 1995 that they killed Ken Saro-Wiwa by a Fulani man. ü We remember the Ogoni 9. Ken Saro-Wiwa, Saturday Dobee, Nordu Eawo, Daniel Gboko, Paul Levera, Felix Nuate, Baribor Bera, Barinem Kiobel, and John Kpuine. They are gallant men. ü Ogoni must be free. We almost there. Ogoni will control their resources and elect their leaders. ü The present Chief Judge killed Ken Saro-Wiwa and today he is rewarded. We imagine what pressure Binta Nyako is undergoing now because they wanted her to sentence us to death. ü All of a sudden Saraki is now taller than Buhari. ü The Queen wrote a condolence letter to Nigerians over Buhari's death. ü Some people said I should speak like a head of state and I said no, because the zoo is gutter and I will follow them inside the gutter and get what I want. ü The case of Jubril is international conspiracy, even some Igbo leaders knows that Buhari is dead and that thing Jubril is not Buhari. They are quiet, because they don't want to give me the credit for speaking the truth. ü Ohanaeze and some Igbo people are jubilating for a mere VP slot. Everyone knows a doormat is more important and useful than a Vice President. ü Tonight, APC must know Jubril cannot contest 2019 election, if he does, then Nigerians are less than humans, because he is not qualified and he is not Buhari. ü Nigeria will go down in history as the greatest mistake Britain ever made. ü If you think Atiku will restructure Nigeria then you are more stupid than Abba Kyari who foisted Jubril on you. ü On 2nd February 2017 African leaders (AU) stood a minute silent for Buhari Nigeria's late president. ü On 18/01/2017 he was flown to the UK. ü He went through brain surgery and came out brain dead and in coma. ü On 28/1/2017 he was flown to Saudi Arabia and buried. ü The wife was captured at the Airport and when she was asked where she was coming from, she said she travelled to Saudi for lesser Hajj. She was returning to Nigeria and not UK where her presumed husband was. ü Immediately 4 men were fetched from Saudi Arabia to be paid 250 million dollars to impersonate Buhari. ü They got one and for nearly 4 months Doctors were working on him. Till they got something very close to his resemblance. ü They couldn't fix the ears. ü They couldn't change his fingerprint and that is why he couldn't access Buhari's office in Aso Rock but they lied that rodents took over his office. The doors were changed with the new man's fingerprints. ü The Log of Aircraft and movements is there as evidence...."
ü Today, three Governors are threatening to speak if APC dares them. ü Ask Okoroawusa what he intends to say that would make Nigerians burn down Aso Rock? ü Ask Amosun of Ogun state, what he wants to say that will shake Nigeria if APC pushes him again? ü If Dele Giwa was alive, he is the only Nigerian journalist that could have written him out. ü All the department of government are manned by Fulani illiterates. Voracious criminals’ intents on killing and stealing. Everything in Nigeria is evil, their leadership is evil. ü Sir Ahmadu Bello made it very clear in an interview that he was not in support of one Nigeria. He said," if I want a job done, and there is no northern than can do it, I won't give it to an Igbo man. I will rather give it to a white". He was killed in a coup after that interview. ü You heard El-Rufai, that midget in Kaduna government house called Peter Obi a tribal bigot. If you are Igbo know that Fulani hate you. They can't like you. It's in their nature to hate you no matter what you do to please them, they can't like you. ü The only restructuring that Nigeria has done, is restructuring Jubril into Buhari. ü The way Nigeria is today, no one from the middle belt will ever become president. ü The Fulani caliphate has been ruling Nigeria more than anyone else, that's why Nigeria is in a mess. ü Jonathan went to the north and they blocked him and stoned him but he didn't kill anybody. But ordinary Buratai killed thousands of Shiites protesters blocking his way. ü What has Ohanaeze ever done for you if not to go and sell your interest to the north? ordinary road block, army check point, Nnia Nwodo could not clear. ü Today they said Nzeogwu is from South-South but when it comes to hatred he will become an Igbo man. ü Nigeria is a global embarrassment and a disgrace. If you say you are a Nigeria you are a disgrace. ü Nobody can fix the zoo, be it Atiku/Obi. ü There is no Buhari to vote out, Buhari is dead. ü How will you go and vote in an election a Sudanese man is in the ballot box? ü Buhari is the most successful international fraudster in the whole world, aided and abated by Abba Kyari. ü Look at that thing ear properly, you will know he was brought to replace the late Buhari. ü Ohanaeze and his other southern leaders gathered and said without restructuring there will be no 2019 election, what is happening today? The same southern leaders are the ones asking you to go get your PVC to vote. ü Atiku will not give us our freedom. ü In the zoo every 4 years, a bunch of criminals will line up to be voted into office. ü Buhari never passed any exams, when he died they replaced him with a Sudanese man. Unbelievable! ü Buhari never finished any course in his life. He is a complete failure. He sat for no exams. His name is not in any database of London GCE and Ghana WAEC. Abba Kyari should be in prison. The only academic paper late Buhari has is Grand Commander of Cattles and Fulani Herdsmen. ü Ohanaeze remained banned. If they gather anywhere in Biafra land, they will be scattered. ü Most great Biafran saboteurs went to University of Ibadan, e.g. Nnia Nwodo. ü Only fools are proud of one Nigeria. ü Biafra must come. Whatever I say, I do. I love my people. Oil or no oil, gas or no gas. People of Biafra will struggle to get Biafra passport. People will come from all over the world to Biafra. ü No politician anywhere in the world has given us a dime. IPOB is funded by IPOB worldwide families. ü Abia State IPOB are very strong. We thank them for holding forth the Radio transmitters. Igweocha will rise again. Mazi Chukwudi Ofomah is doing well. I thank and appreciate you all who are performing. So, keep up the good work and you will be appreciated. ü I hope to speak to you again next Saturday. May Chukwu Okike Abiama bless you all. ~ Mazi Nnamdi Kanu, IPOB supreme leader.